Today, a luxurious high-tech bathroom is no longer a dream. With the recent advancements in the bathroom technology, several leading bathroom accessories brands have made the idea of a smart innovative bathroom a reality. The bathrooms today are introducing a smart range of innovative and ultra-modern bathroom sanitary ware, faucets, and accessories that aim to enhance the overall bathroom experience. Smart Showers: The new tech shower panels and shower cubicles are gradually replacing the traditional modes of bathroom showers. These advanced set of shower panels have made it possible for the division of wet & dry zones in the available bathroom space. While the cascade showers are giving a waterfall experience, the rain showerheads are letting the users experience true rainfall in their bathrooms. Some of the leading examples of high tech showers nowadays include aromatherapy jets, steam jets, and so more. Moreover, the modern showers also come with a digital interface that gives the users a complete control over the flow of water, its temperature, light, steam, and even sound effects to enrich the bathing experience. Some shower panels also come with additional accessories like massage functions and towels on the bar while some showers also allow two people to shower at the same time. As such, several sanitary products are experiencing a technical touch to enhance the overall user feel. High Tech Toilets: Some of the leading sanitary ware products like Hindware sanitary ware are implementing the concept of high tech toilets in the modern bathrooms for a heightened feel. The smart toilets are coming in a variety of smart innovations and technological applications that aim to modify the bathroom experience. For instance, there are toilets that do not require hands or paper. These toilets come equipped with automatic temperature-controlled water sprayers, spraying wands and automatic dryers. Moreover, there are toilet seats that come equipped with seat warmers and LED lights. In addition to the modern sanitary ware edition, the toilets also come with self-cleaning technique along with anti-microbial seats. If you are highly germaphobic, then there is a toilet technology that comes with motion sensors to raise and lower the toilet lids automatically. Smart Soaking Tubs: The modern bathroom designers are moving towards bringing back the Jacuzzi bathing trend with a touch of innovation in the form of soaking tubs. The state of the art bathroom designs are tossing away the stand-only shower feel to be replaced with the heavenly feel of the soaking tubs. From the plethora of advancements taking place in the sanitary ware accessories, the bathtubs are striving towards modernization at its best. 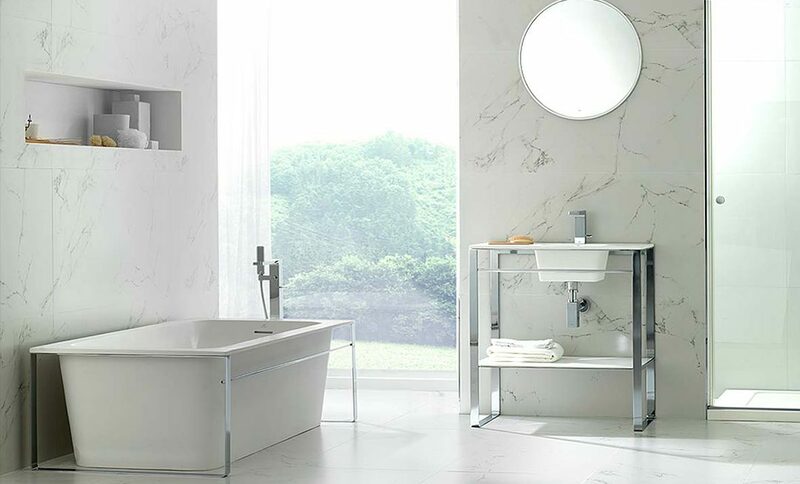 Some of the technological applications one can expect in the modern bathrooms include the introduction of stand-alone tubs with no shower, small Japanese-style soaking tubs, and so more. The sleek, modern bathroom faucets that pour into the tub directly are also the talk of the industry. Nothing can beat the air bath experience that implies a modern take on the massaging jets. The bathtubs are also experiencing the therapeutic applications with the introduction of chromotherapy as well as mood-boosting lighting. Digital Faucets: With so many advancements going around in the bathroom sanitary, bathroom faucets are no behind. The digital faucets are the most innovative applications aimed at conserving water and energy resources in a smart manner. Some of the technological advancements one can expect in the faucet industry today include touchless technology, reduced tap flow along with digital temperature-control settings, and so more. There is also the introduction of programmable features like timed shower settings or a set teeth-brushing option. You can also be amazed by the latest infrared tap technology that is able to “read” the specific user and turns its settings off when it senses that the hands are not under the faucet. As such, a lot of water and energy gets conserved naturally. Introduce Some Hot Gadgets: A smart bathroom is incomplete unless it has a set of some smart appliances and gadgets that spice up the entire look & functionality. You can bring along some highly innovative range of smart gadgets to adorn your bathroom. These gadgets or appliances would not only highlight the overall look, but would also satiate your multiple functionality needs. For instance, the installation of the refrigerated bathroom cabinets could serve a great purpose of storing the bathroom medicines cool & long lasting. Moreover, it can also be used for storing some cool drinks to have an enriched spa feel. To add a luxurious touch to your bathroom, you can also introduce a lavish display of LCD shower panels that have multiple functionalities to escalate your bathing experience. From controlling shower temperature to water flow, steam and a touch of music, you could spend your entire time in your bathroom. Some people also go for the highly contemporary waterproof TVs in their bathrooms. If you wish to have a royal bathing feel, then watching TV as you bathe could be a heavenly experience. With so many technological advancements taking place in the bathroom arena, you can go for installing some of them in your household as well. These high-tech bathroom applications would simplify and enhance your bathroom feel each day. If you are looking for some high-tech and designer options of sanitary ware in Bangalore, then Maruthi Ceramics has some of the best designs for you. Select from a myriad of bathroom sanitary wares and additional accessories to accentuate your home. Introduce technology to upgrade the quality of your life.